Yes. Another tie headband. What can I say? I love making them! 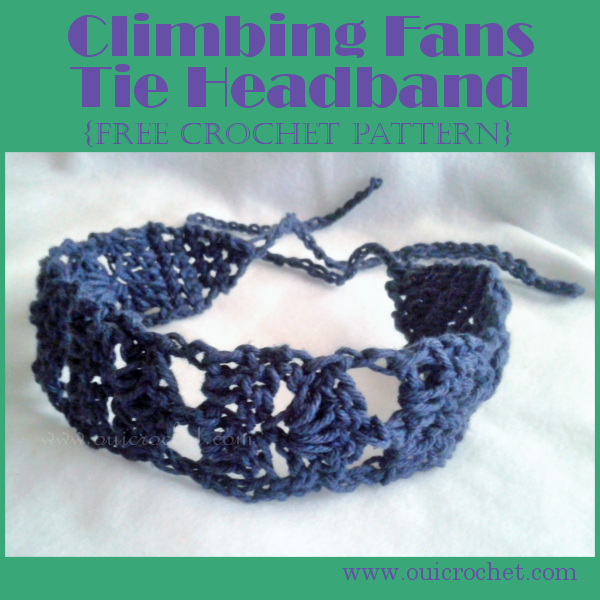 This tie headband sports elegant fans that seem to climb the double crochet rows. I really enjoyed working with this stitch, so I just had to share it with you! I could fill this section with reasons that tie headbands are so cool, but if you have seen the posts for my other tie headband patterns, you've heard it all before. That said... if you haven't seen them, then you might want to check them out. It's okay, I'll wait. Just click a link to open them each in a new tab. Row 8: ch 1, sc in first st, ch 2, skip 2 dc, sc in next dc, ch 2, sk 2 dc, sc in 3rd ch of tch. Turn. Row 9: ch 1, sc in first sc, 5dc in next sc, sc in last sc. Turn. Row 10: ch 5 (counts as dc+ch 2), skip 2 dc, sc in next dc, ch 2, skip 2 dc, dc in last sc. Turn. Row 11: ch 3 (counts as dc), 3 dc in next ch 2 space, dc in next sc, 2 dc in next ch 2 space, dc in 3rd ch of tch. Turn. Rows 12-27: repeat rows 8-11. So pretty! I'm making headbands for my daughters for Chrismas--they both love headbands! What a great project! My friend is having a birthday soon and this would be a perfect gift. Thanks for sharing!